Way back when, there were 800 or so different ceramic and crystal cartridges available for replacement use	with varying mounting styles, tracking forces, pin/plug connections, and outputs. Today there are only	a handful of low output ceramic cartridges still being made. If the cartridge you need is no longer available	as new old stock, it becomes necessary to use / adapt one of the available cartridges. Ceramic (and low output crystal) cartridges were the most diverse in terms of mounting styles and pin/plug configurations so physical modification to mount a replacement is the	primary consideration. Here, we are talking about cartridge outputs generally in the 0.2 to 1.3 volt range, and tracking force 10 grams or under. 1. Output voltage - A 0.5v cartridge can substitute for most with acceptable volume. For cartridges at the upper end of the range (1.0 volt and higher), an experienced	technician can sometimes modify the amplifier to get a little more gain, and better bass response. We cannot advise on how to do this. 2. Tracking force - Cartridges today are available tracking in the range from 3 to 8 grams. Select one that has a range that is closest to the original cartridge's tracking force	requirement. 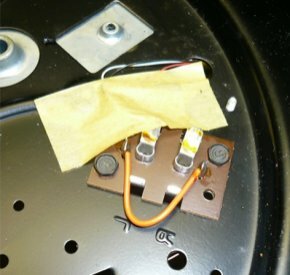 Adjusting the tracking force on a record player or record changer is easy on some models, and more difficult on others. We cannot advise on how to	do this for brands other than V-M so get the service manual. Sometimes weights can be glued in the tone arm to increase weight. Making a model track a little lighter may be more difficult, if there is not a counter weight spring in the design. a)	Cartridges with half inch mount - this means a cartridge with two screws, and the screw hole centers are spaced one half inch apart. This is the easiest situation and the replacement cartridge may be able to be installed without modification. 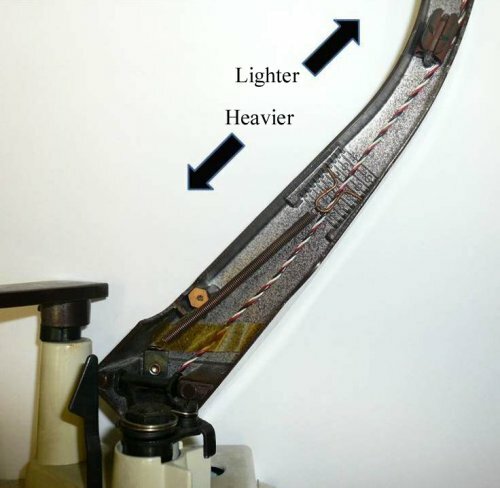 In some cases, spacers may be needed in models with tall tone arm headshells	so that the flip needle does not strike the side of the tone arm, and again, the	tip of the needle is close to being in the same place as before. b)	Cartridges with 5/8 inch mount - many RCA record players fall into this category. Longer screws with spacers can sometimes be used to "spread across" the	increased distance to make a half inch mount style cartridge work. For the RCA 45 players, see the V-M and RCA 45 Player Parts page, where kits are offered to replace original low output cartridges. c) Cartridges with special mounting designs - Many Telefunken, Grundig and other European designs, along with some RCA models may have original	cartridges that snap-in or are on a floating bracket type arrangement, or have some other mounting style that does not involve using two screws. These	require some creativity. 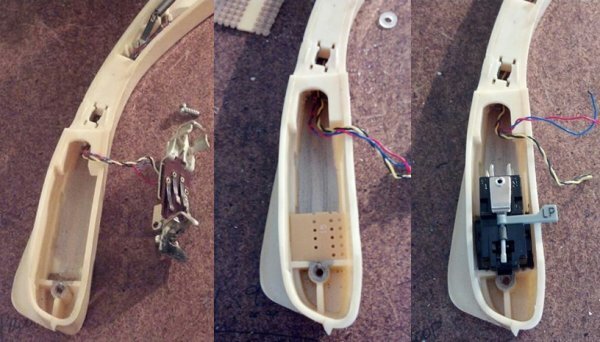 It may be necessary to remove bracketry and glue	in a mounting "pad" made from scrap pieces of plastic that the replacement	cartridge's mounting bracket can be glued to. A Telefunken example is shown	below. a)	Three wire arrangement. In this situation, there is a common ground. 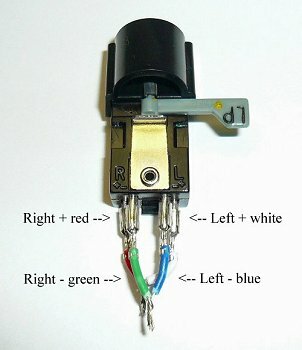 Either wrap a bare wire around the two ground pins tightly and attach tone arm wire to only one pin, or make a jumper to connect the two grounds together	as shown in the photo at right. b)	Two wire arrangement (mono). Click on Stereo cartridge replacing a monaural cartridge to go to where this conversion is discussed. The following are the cartridges that we believe will be around for awhile. Replacement	needles will also be available for the foreseeable future. •	Pfanstiehl® and EVG varco replacements sold under various numbers, on this website	sold as P132, P226 and P228. These are all the same cartridge today, the only difference	is the P228 which is sold with short 4 conductor tone arm wires with clips for use in replacing	monaural cartridges. These have flip over needles which makes them very popular. •	Chuo Denshi P188BR with half inch mount bracket. Although listed as 0.35v output,	this cartridge tends to "overachieve" and sounds as loud as the rest in this list. It also does the best job of tracking modern records, and a needle with a 3.0 mil tip	can be ordered on the Needles/Styli page for playing 78 rpm records. •	Pfanstiehl® P51 with half inch mount bracket. This monaural cartridge is popular with juke box	owners and is also available in versions with 0.7, 2, and 3 mil single tip needles. •	Tetrad replacements. See the next section. After 1965, many record player manufacturers switched to using cartridges from the Tetrad Company. These can be recognized by their compact size and small four pin plug that plugs into the rear. Their modular design, reasonable price, and range of outputs made them very popular. 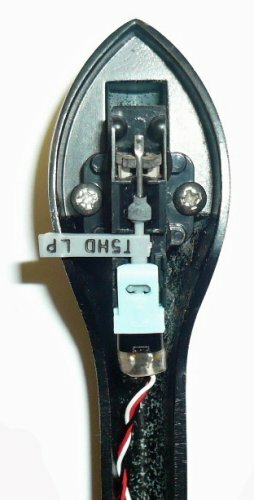 The basic	element could be used as-is, typically glued into a manufacturer's custom designed plastic or metal headshell, or glued to a mount of the manufacturer's choosing - standard half inch mount, "snap-in"	mount, and a special single screw mount for BSR record changers were the three most popular mounts. Tetrads also join the list of ceramic cartridges that we believe will be around for awhile. 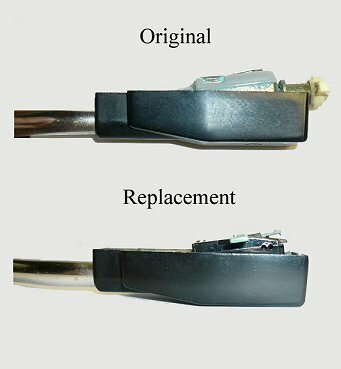 There are two sources that we carry - new old stock originals (EV5632 series) and Pfanstiehl® replacements, discussed	as follows. To see them, Search by Cartridge Brand and select Tetrad and click GO. • EV5632 series - these are relatively recently made originals and suited for direct replacement	of most Tetrad originals. The original wire harness can be used as they are wired as Tetrads. Available as shown, standalone or with a mount of your choosing. • Pfanstiehl® P400 series. 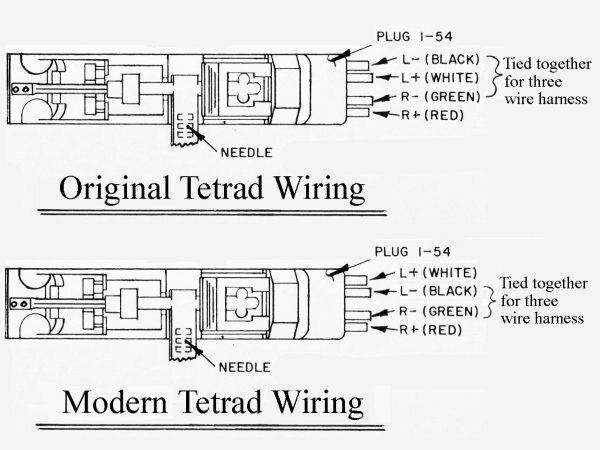 These are current production replacements, but the manufacturer does not follow the Tetrad design in terms of how they are wired. They look the same but are wired differently internally. A new wire harness assembly is included, These are suitable for new installations, in particular when taking advantage of their small size to replace a ceramic cartridge of an entirely different type. For example, see the KMGVX2 Magnavox kit on the Cartridge Kits page. Default is to supply with an M853 needle, but if you advise that you want a different needle, and include	make and model information on the shopping cart order page, then the order will be filled with that needle. Be sure to click SAVE/UPDATE button below the box containing this information before	proceeding to checkout, or the information will be lost! For the technically inclined: Tetrads in the past were available in capacities ranging from 550pf to	7000pf. Today, only 700 and 1000pf versions are expected to be available long term. If seeking a higher	capacity replacement, Contact Us for current status of availability. The situation here falls into three groupings. • If the cartridge to be replaced is a one volt or less model, tracking under 10 grams, then follow the guidance given in the Ceramic cartridge section. • If the old cartridge has a higher output rating above a volt and suitable replacements have sold out, and if the tracking force is 10 grams or less, a ceramic cartridge can be used if the amplifier is modified with an additional amplification stage. Some professionals can do this. We cannot advise on this further, except to say that magnetic phono preamps sold on this website and others, cannot be used for this purpose. • In early 20th century models with record changers and crystal cartridges of any output, the issue here becomes the tracking force requirement. Some of these require an ounce or more of tracking force or the record changer will not "trip" and perform automatic functions. In this situation, rebuilding the present cartridge with a new crystal would be the choice. We do not do cartridge rebuilding . Another alternative would be to disable the automatic functions, lighten the tone arm and follow one of the situations above to replace the cartridge. The player would then work in manual mode only. • Hum. Models with magnetic cartridges generally have 4 pole motors, better suited to keeping	magnetic fields away from the cartridge. Models built with ceramic or crystal cartridges generally have 2 pole motors. Installing a magnetic cartridge can result in a high level of hum. In some cases, a ground loop can be installed that will use the metal base plate and metal tone arm to greatly diminish the amount of the magnetic field reaching the cartridge. This can result in hum levels nearly as low as with a 4 pole motor. 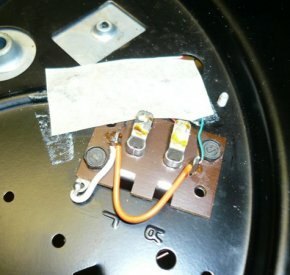 An example is shown	in the pictures where a ground wire is installed that connects the left and right ground	connections from the cartridge together, and then ties them to a metal portion of the record	changer base or mechanism. •	Tracking force. Many modern magnetic cartridges track too light to use in a record changer. The	record changer, depending on its age, requires more or significantly more tracking	force to operate the automatic functions. The amount of tracking force required	must be known in order to determine the feasibility of a magnetic cartridge conversion. •	Output voltage and equalization. Magnetic cartridges require a special preamp to be used	in place of a ceramic or crystal cartridge. These are sold on this website and others. These	typically have an output voltage of between 0.5v and 1.0v and this is not sufficient to replace	crystal cartridges originally having outputs of 2 volts and above. • Mounting considerations. Since most magnetic cartridges available today have half inch mounts, this restricts the record changers that might be converted. A model with a thin headshell and Tetrad cartridge is not a candidate for conversion. As just discussed, this type of conversion should only be attempted by someone with a fair degree of technical prowess. Monaural cartridges with a flip over needle are no longer made. If a single tip needle will suffice	then a P51 series cartridge can be used. When a flip over needle is desired, a stereo cartridge can be used. All the other considerations (output voltage, tracking force, etc)	discussed in other sections above must also be followed. The P228 sold on this website contains short wires with clips. 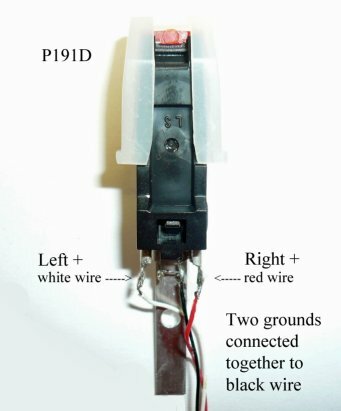 Connect the Left and Right	grounds together and attach to original ground wire, and then connect the Left	and Right feeds together and attach to original feed wire (see picture). Vintage record players have a style and sound all their own but its important also to understand their limitations before spending money on a repair or restoration. Older players from the 1950's even if outfitted with modern cartridges, may not have the refinement in the rest of the mechanism to play the most recently made records without some skipping. Later era record players, those that were in the higher price ranges when new, and those with magnetic cartridges will do better.